Are you a job seeker and looking for best job sites in India? Well there are thousands of Job Search Websites on internet which provides job listings for MBA candidates but there are only few which gives better return of your time. 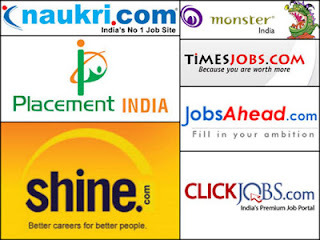 In our today's post we're listing top 10 websites to find a job in India for MBA professionals. Naukri.com is India's largest online job site, provides recruitment classifieds and related services to job seekers and Corporate Customers. As of March 31, 2011 Naukri.com had a database of about 25 million registered job seekers and over 80,000 live job listings from Corporate Customers. If you're looking for a job after MBA, this is the place you must be on. Monster India is a Flagship Brand of Monster Worldwide, Inc., Which was founded in 1994 by Jeff Taylor & has a presense in more than 50 countries. This is the 2nd best job portal in India & some of the top employeer relize on it for their recruitment needs. We highly recommend MBA job seekers to register on this site to get some good job offers. CareerBuilder India is one of the fastest growing job portal in India. It is another global brand like Monster & have its presense in U.S., Europe, Canada and Asia. Employers like NDTV, MSN India etc trust this brand for their recruitment needs. Shine.com is an initiative by Firefly e-Ventures Ltd., a 100% subsidiary of HT Media. This is another top job portal in India. Like all other job sites in India, registration is free of cost. This is another job website that we recommend to our blog readers. I know it's not a job website. Social networking is now a part of our life & corporate world is not away from it. LinkedIn is world's largest professional networking website & if you're a working professional this site can get you some cool job offers. Many of the big corporate are highly active on this website to search for candidates. ApnaCircle is a Viadeo Group Co. and is India's first and leading Business and Career networking site. To attract more users for the site, The company has introduced job search feature on the website. Companies like Dell, Axa, Total, PNB Paribas are active on ApnaCircle. This is one of the fastest growing website in the world for professional networking. This job search website came into existence in the year of 2004. It is another most popular job portal in India. The website has a database of over 10 million candidates with over 20,000 new resumes added every day. More than 25,000 clients post jobs on this website. JobsAhead is another popular job search engine in India, although i personally never get many job offers from this website. The website claims that 3 Million job seekers, 6000 corporate clients and 1,50,000 plus jobs are available on the website. JobStreet is a leading player in the field on job serach in Asia Pecific. This Job search website is very popular in Malaysia, Singapore, Thailand & Japan.In India it's not as popular compare to other counties i mentioned. Registering on this site may get you some job offers. Established in the year 1997, this portal is managed and owned by Weblink. In Pvt. Ltd. The job portal is not very popular among employers but some good consultants are active on this portal. Most of the companies recruit through job consultants and from this prospective this could be a good option for your job search. Hope the following job sites in India will help you search a better job for yourself and will help you grow in your career. Happy job hunting!